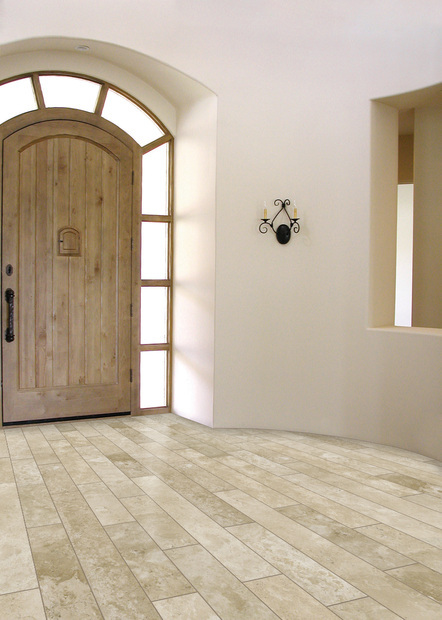 Winter can be a hard season for your floors. Snow and ice, dirt, sand, salt and ice-melting chemicals can cause big problems on flooring. Abrasive damage from salt and sand are like a sandpaper on your floor. Liquid damage from melting snow can warp flooring or leave stains. Ice-melting chemicals cause even worse damage. While you can't completely stop winter from entering your home, there are some key things you can do to limit seasonal damage to your floors. Get a sturdy mat and place it outside your door. That mat will be the first line of defense in keeping melting snow, ice and sand outside your home. Place a second mat inside to stop those wet boots in their tracks. Stay away from small area rugs and look instead for a rubber-backed door mat. It's more durable and will keep moisture off the floor beneath the mat. While you're at it, add a boot tray just inside the door as reminder for people to take off their shoes and boots. Small particles of sand and dirt can easily be tracked into your home - even with mats. Make a point of sweeping or vacuuming them up every day if needed. Especially if you have hardwood floors. The sand and dirt might be small but it can do big damage if ground into your wood floors. Buy some basic cleaning supplies suited for your type of floor and keep them on hand. Then when mud is tracked in, you're ready to take care of it before it becomes a problem. Need help with some tricky cleaning situations? Check out our free cleaning guides below!